Two different regions of Georgia, different landscapes and culture, different food and traditional, different culture and songs. All together we can dive and discover and participate in the locals’ life during our journey. 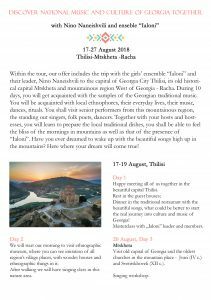 Within the tour, our offer includes the trip with the girls’ ensemble “Ialoni” and their leader, Nino Naneishvili to the capital of Georgia city Tbilisi, it’s old historical capital Mtskheta and mountainous region West of Georgia – Racha. During 10 days, you will get acquainted with the samples of the Georgian traditional music. You will be acquainted with local ethnophores, their everyday lives, their music, dances, rituals. You shall visit senior performers from these mountainous region, the standing out singers, folk poets, dancers. Together with your hosts and hostesses, you will learn to prepare the local traditional dishes, you shall be able to feel the bliss of the mornings in mountains as well as that of the presence of “Ialoni”. Have you ever dreamed to wake up with the beautiful songs high up in the mountains? Here where your dream will come true! Happy meeting all of us together in the beautiful capital Tbilisi. Dinner in the traditional restaurant with the beautiful songs, what could be better to start the real journey into culture and music of Georgia! Masterclass with ,,Ialoni” leader and members. We will start our morning to visit ethnographic museum, where you can see imitation of all region’s village places, with woodes houses and ethnographic things in it. After walking we will have singing class in this nature area. 20 August, Day 3. Mtskheta. Visit old capital of Georgia and the oldest churches in the mountain place – Jvari (IV c.) and Svetitskhoveli (XII c.). Day 1. All the way to Racha. Racha is located 7-8 hours drive from Tbilisi. We will take it easy and will not do too many activities on arrival to Ambrolauri. Checking in guest house called “Tsibena”, the wooden cottages – the place we will sleep when in Racha. Nothing special for tonight just walk around, talk, sing and have dinner. Rest! Day 2. Racha’s grandmas and grandpas. Let’s sing along! A visit to the adjacent villages, meeting the singing senior grandmas and grandpas. We will meet Grandma Mariam Bakuradze (82 ages old). More villages to visit: Sakaura, Likheti, Uravi. We will have lunch in one of the family houses. Day 3. How to cook and sing in Racha. Singing workshop to start another good day. Than we will visit a village to meet senior performers Lali Margiani, ensemble “Buba” from the village Glola. The delicious part of the day – cooking of Rachian “lobianis” (kidney bean pies). Day 4. A big day in Racha! Visiting a village. Masterclass with the local performers and head of the Ambrolauri Folk Ensemble – Rostom Gogoladze. We will be busy all day so make sure you will have a good sleep as we are leaving for a long and beautiful road to the coast of Geogia in the morning. Rehearsal in the morning to repeat all the songs which we study along this 8 days. Concert with Ialoni in the Ambrolauri culture center. Travelling back to Tbilisi (or kutaisi). Seeing of the visitors to the airport. . The price of the whole tour amounts to 1000 $. This price includes transportation of the visitors from the Tbilisi International Airport (17th August) at the arrival and back to the airport for the time of departure (27th August). Transportation to the regions; three-time meals; Accommodation; Materclasses; price of the museum tickets. Our humble request is to deposit 20% of the amount – 200 $ in advance at the indicated account until 10th July. The new and old capital of the Georgia, mountains of the West of Georgia represent those exotic place which still preserve ancient culture musical, folklore, ethnographic “antiquities.” The mountains still keep the mystic myths, legends, rituals, songs or dances. During out visit to each spot, we shall learn several polyphonic songs characteristic for that region. We shall frequent ethnographic museums. All the participants of the tour will learn and prepare the Georgian traditional dishes themselves, degustate Georgian wine! In addition, above all, you will become the part of historical expeditions, owing to which we shall listen to, record and directly learn songs or dances from rare, senior performers.